This morning I went for my walk without my earphones. I took my phone, because it has a pedometer attached to it and I need to record my steps. Anyway, I read the introduction a book recently and the author said that he realized that listening to podcasts interupted his train of throught. In order to put it all in context, the book Pray, Write, Grow says how we need to be able to have time think. I realized that I do that, as I take my dog for his walk I listen to musci and don’t listen to anything else, even though I think I do. This morning during my walk, I realized that I need to do more of that, I know a LOT. Not to be prideful, but I need to work through what I know, just like I need to develop my own PLN, I need to listen to webinars instead of just signing up for them (yeah I’m one of those). Finally, I need to listen the Holy Spirit as he guides me through this process. I found a series of posts on Facebook that I particulary like and wanted to pass them one. This one next to this is one of those pictures. It represents all of the different branches of the military. They come back, but not the way they left. Some don’t return, either alive or dead! 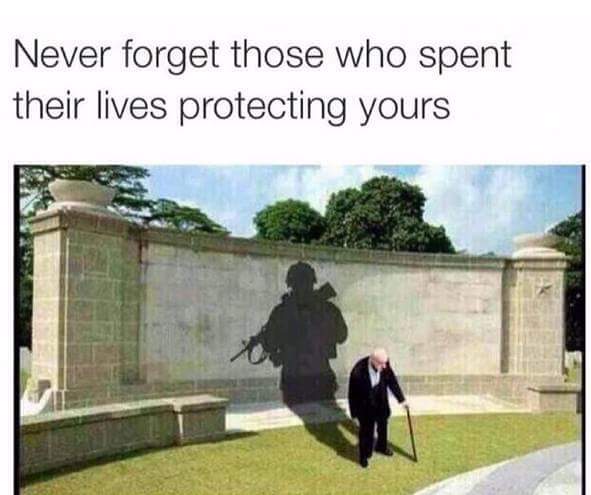 We need to remember and listen to their stories! and women gave me the right. This memorial day, I gathered quite a few pictures I found on my Facebook pages to share with all of you. I am sure that if you spend any time whatsoever on Facebook that you have seen the pictures. Each Memorial Day, my parents go out to the cemetery and lay new flowers. When I lived at home and up until I married, I spend every Memorial Day at a parade. The day was usually gloomy, cold and wet and by afternoon it would warm up. Yesterday at church I looked over at young man who recently returned from Iraq. He was part of a group of young soldiers who went over a bomb. He survived with a lot of scars. Someone recently told me that people didn’t like looking at me because I have only one breast, it is a reminder that I had cancer. I know people have a hard time looking at him because he has so many scars and he is a living example of the cost of our freedom. Another thought I had as I looked over the pictures, was that the right to write what I am writing; the right to believe in one God; the right of my fellow American citizens to live, believe and say their beliefs came at a high cost that we need to remember. Some of our soldiers are still missing, some are in prisons (war camps or their minds) and some are dead. and their families and loved ones do not know where they are, dead or alive. Boy was I proud of how many social media sites I was part of when I found out. This is the biblical definition of a personal learning network. “The way of a fool is right in his own eyes. This past January I chose a word for the year: INTEGRITY. The reason I chose the word, I believe that that Holy Spirit brought it to me; because I would become a woman of integrity. I didn’t think much of it, I knew it would not be easy but I didn’t think it would be as hard. I figured little tests, some I would fail, some I wouldn’t but my, as I know it would go one and God would of course forgive me. I would fix whatever issue. Five main events followed in succession that has, undeterminably, hurt my career. Looking back it was the small events that I could have, should have changed. I didn’t. One even I had no power over, no matter how much I wanted to fix it. I had to get rid of my idol and stop worshipping me. None of the events were prayed about or discussed with God. Grit You need a lot of grit to become of woman of integrity. It hurts this change. I am not claiming to be a modern day Job, but I understood that God is letting me to go through these issues to test me, to develop my faith. Right now my journey is taking me through the Valley of Death. It is scary; I believe God will take me through it. God is powerful enough to overcome everything that has happen as I go through my journey to become a woman of integrity. Now I am working on my PLN. The top connection, the one I am following, top on my friend’s’ list is God. outward appearance, but the Lord looks at the hear. My PLN is to help me to follow the plan that God has for me. One of my goals is to blog on a regular basis in order to establish a base for my business. As I completed the challenge I realized that from now on, this blog will be primarily for my writing. The other blog will be for my educational technology. Not only do I need to do this on a regular basis, but I need to treat it as a craft and write well. It is an example of what people will view, when I say a I am a writer. Next year I will spend more time on each letter. Y and Z: The final two letters of the alphabet!! That is how we teach the letter Y in the phonic lesson in my class. That is pretty much all I have to say about Y, except that it also stands for Yellow. Z is for Zebra. Don’t ask me where I got that one from, but the ends the alphabet.